Central Avenue was originally named Center Street upon Phoenix’s founding with the surrounding north-south roads named after Indian tribes. The original Churchill Addition of 1877, covering a small area north of Van Buren Street to what is presently Roosevelt Street, was the first recorded plat showing Central Avenue with its present name. Despite this, there is evidence of it being called Center Street into the 1930s. A replat of Phoenix’s original townsite in 1895 was the first to officially show numbered streets and avenues starting from the east and west sides of Central. Phoenix’s first school was built on Center Street and Monroe in 1874 as a one-room adobe. A new four-room schoolhouse replaced it in 1879 as the fourth brick building in the city, and the school was expanded again in 1893. By 1919, the school had deteroriated considerably and was condemned and sold. The luxurious Hotel San Carlos, the first downtown hotel to feature air conditioning and elevators, opened on that spot in 1928 after a long delay. The Phoenix Indian School was established in 1891 giving Indian School Road (4100 N) its namesake. Near North Mountain, architect William Robert Norton subdivided the first parts of Sunnyslope in 1911 amidst a “squatters’ community of asthmatics and tuberculosis patients” whose makeshift dwellings were illegal in the city proper. By 1917, a mile-long bridge was open over the immense Salt River ultimately connecting downtown with South Mountain, the latter known as the Salt River Mountain at the time. The Westward Ho was constructed in 1927 and would remain the city’s tallest building until 1960. Brophy College Preparatory (4701 N) opened for the first time in 1928 amidst agricultural fields. The Heard Museum (2301 N) opened in 1929 with little fanfare but would grow to be a highly respected institution of Native American culture and history. As Phoenix sprawled north, developers found plenty of available land on Central Avenue and began capitalizing on the cachet of the youthful city’s signature boulevard. Local steakhouse legend Durant’s (2611 N) opened in 1950 and has changed little other than that patrons today enter the restaurant through the back off the parking lot as celebrities and other socialites once did back then. Park Central Mall (3110 N) replaced a dairy farm in the middle part of the decade, signaling the beginning of downtown’s long decline with new ring suburban retail. America’s second McDonald’s restaurant was built near Indian School Road in 1953. It was the first McDonald’s franchise, the first to feature the Golden Arches, and served as a model for Ray Kroc’s Illinois store. These early commercial developments foreshadow the trend towards auto-centrism on Central Avenue and indeed the rest of the city. The first major high-rise built on Central Avenue outside of downtown was the Phoenix Towers (2201 N), erected in 1957. The Phoenix Art Museum moved to Central Avenue in 1959. Phoenix fully annexed Sunnyslope, at Central’s north terminus, that year. Central Avenue to its southern terminus, South Mountain, where minorities had been historically redlined, was annexed a year later. The 1960s brought a wave of high-rise development in Phoenix to Central Avenue that the city had hardly seen in its modern history. In 1960 the Phoenix Corporate Center opened, which at 341 feet (104 m) became the tallest building in Arizona. The first phase of the Rozenweig Center, known today as Phoenix City Square, was completed in 1964. Architect Wenceslaus Sarmiento’s largest project, the landmark Phoenix Financial Center (3443 N, better known by locals as the “Punch-card Building” in recognition of its unique southeastern facade) was also first finished in 1964 for banker and developer David Murdoch. Eight floors were added four years later. In addition to a number of other office towers, most of Phoenix’s residential high-rises, such as the Landmark on Central (4750 N, then known as Camelback Towers), Executive Towers (207 W. Clarendon) and the Regency On Central (ROC) (2323 N, then known as Regency Apartments), were built during this decade. In 1971, Phoenix cemented the precedent of previous ad-hoc zoning decisions with the adoption of the Central Phoenix Plan, which envisioned unlimited building heights along Central Avenue. The new plan, however, did not sustain long-term development of the “Central Corridor.” Only a few office towers were constructed along North Central during this decade and none approached the scope of projects constructed during the previous decade. Instead, downtown resurged in popularity during the 1970s, witnessing a flurry of construction activity not seen again until the urban real estate boom of the 2000s. In 1979, Phoenix adopted the Phoenix Concept 2000 plan which split the city into urban villages—each with its own village core where greater height and density is permitted, further shaping the free-market development culture. Phoenix officially turned from its roots as a city built around its two main drags to a city of many nodes later connected by freeways. The cluster of high-rises north of Thomas Road became part of the Encanto village core. Development on North Central Avenue began anew in the 1980s as part of that decade’s real estate boom with a second wave of office towers. One Camelback was built in 1985 at the intersection of Central and one of Phoenix’s other signature streets, Camelback Road. It is likely the last structure that will be built that tall that far north, thus endcapping the built-out potential of the Central Avenue skyline almost five miles (8 km) from its origin downtown. The Phoenix Indian School was closed in 1988 and would remain vacant for years. The city’s current third-tallest building at 397 feet (121 m), Qwest Tower, opened in Phoenix Plaza in 1989 on Thomas Road (2900 N). The Viad Tower, completed as the Dial Tower in 1991. The building notably resembles a Dial bar of soap. Phoenix adopted the Arts District plan in 1992 in an attempt to connect lower Midtown’s cultural amenities together in a walkable area, but the private development that the plan anticipated never arrived, though Burton Barr Central Library (1221 N) opened in 1995. The savings-and-loan boom that birthed new towers for Midtown Phoenix plagued it throughout the economic doldrums of the 1990s. The city’s current fifth-tallest at 374 feet (114 m), the Viad Tower (1850 N) opened in 1991 as the Dial Tower, an isolate between the Downtown and Midtown skylines and would be the last new tower constructed for Midtown Phoenix. Floorplates of office towers built in previous decades had become functionally obsolete and contributed heavily toward Midtown’s high vacancy rates. Even despite the recession, the swank Biltmore area surrounding 24th Street and Camelback Road began to eclipse the Central Corridor as the Phoenix metropolitan area’s premiere office destination with mid- and low-rise developments such as the Camelback Esplanade. But as the 1990s were unkind to Central Phoenix’s oldest parts, a renewed interest in the central city was taking form, this time focused on new residences instead of offices. After numerous failed initiatives, Phoenix voters finally approved the Transit 2000 Regional Transportation Plan which dedicates a percentage of funds raised through a 4/10-cent (four cents on ten dollars) sales tax to build the METRO Light Rail line. The 20-mile (32 km) initial phase, which opened for service in late December 2008, begins at Christown Spectrum Mall, to Camelback, down Central, and then down Washington Street en route to Tempe and Mesa. 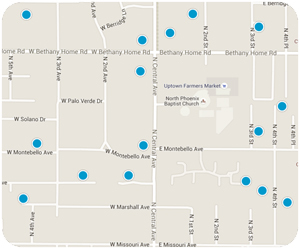 On Central Avenue, there are seven stops in Midtown and Uptown Phoenix and three in downtown. The three-year construction process commenced in late 2005, with the final rail being laid in late April, 2008. Many businesses experienced challenges during construction, but most have persevered—some through an assistance program sponsored by Valley Metro and the City. The alignment of light rail down the center of Central is the most significant event in the street’s history. It reformed its future growth as Phoenix adopted transit oriented development zoning standards in 2003 within 1/2 mile of stops, effectively making the autocentric developments that had come to define Central Avenue a thing of the past. In Midtown, the market responded with two mid-rise projects, the Artisan Lofts (1326 N), which opened in 2004 and the Tapestry on Central (2302 N), which opened in 2007. Tapestry is also notable as its construction brought down the last of the estate homes on that stretch of Central. Capitalizing on its retro mid-1960s styling, Camelback Towers became the Landmark on Central in 2004, continuing a tradition of the city’s few apartment towers becoming ownership condominia later on. Also that year, Century Plaza (3225 N), originally built in 1974 as offices, began a complete exterior and interior remodel as part of its conversion to condominia. As reconstruction continued, two additional floors were started in 2007. Century plaza is now known as “One Lexington”. Steele Indian School Park opened in November 2001 on the site of the old Phoenix Indian High School five years after an intricate three-way land exchange involving the Barron Collier Company and the federal government. In Phoenix, Collier received a 15-acre portion on the southwest corner of the site for long-term investment in addition to the Downtown block on which the Collier Center was built.